Welcome to the PrestoDoctor Shop! With safety in mind, this handheld vaporizer is equipped with a 20-second auto-shutoff feature. It also includes two different types of heating elements that can be unscrewed and switched out. One of them is a ceramic dish inside of a coil-less chamber. This chamber does not produce any combustion, as it never directly touches any hot coils. Thus, the ceramic dish better preserves the flavor of your oils by heating up more slowly. On the other hand, you can use the other included atomizer for a, particularly smooth hit. This atomizer contains dual quartz rods with titanium coils. Quartz takes longer to heat up than ceramic, which is why it produces effortless hits. By including two types of atomizers, this vape kit gives you more freedom of choice. Additionally, this CBD dabs pen has adjustable airflow. You can control the amount of airflow by rotating the textured band, located beneath the glass mouthpiece; it exposes/covers 3 air holes surrounding the pen. In addition to the vape pen itself, this kit also comes with several accessories: a packing tool, retractable micro USB charger, extra mouthpiece, and extra “O” rings for securing the glass mouthpiece. 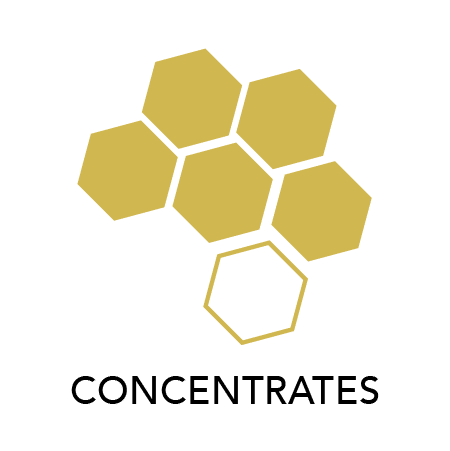 Concentrate vaporizers are vapes specifically designed for use with legal concentrates, essential oils, and legal waxes. Concentrate vaporizers contain a metal coil that heats up to vaporize your substances and turn them into tasty vapor ready for inhalation.